Sheri Kaiserman, the now former head of Wall Street’s Wedbush Securities, has left the company in order to co-found a Blockchain investment fund and advisory business, Bloomberg reported March 20. Kaiserman is seen as a Bitcoin pioneer in the traditional finance world — she had been Wedbush Securities’ head of equities in 2013 when she approved the release of an analysis of Bitcoin’s (BTC) value, the first Wall Street company to do so. In 2014, Wedbush Securities had also begun using crypto wallet and exchange Coinbase’s services in 2014 to allow customers to pay in BTC. Kaiserman’s new Blockchain investment fund, Maco.la, has already raised $6 mln in funding, led by Strome Management Investment, and has a goal of raising $40 mln in total, according to their press release. The LA-based advisory business and fund, two of whose five co-founders are women, will “inves[t] capital and resources into innovative enterprises seeking to optimize and accelerate their business with the use of blockchain technology.” The fund has already made a reported three investments, one being in the holding company of the crypto-friendly Silvergate Bank. 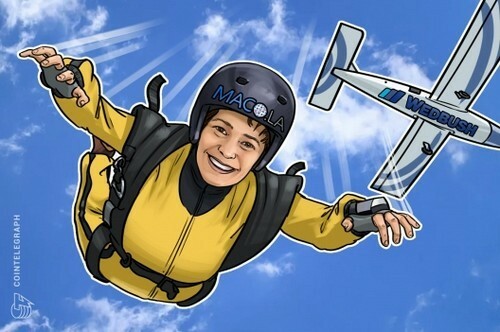 The company’s press release also notes that the fund’s leadership team will work with the US Securities and Exchange Commission (SEC) as it clarifies regulations for the crypto industry, which Kaiserman sees as a good thing, telling Bloomberg that “while regulation is spooking everybody, it will create validation for the space.” She added that the fund retains a securities lawyer to make sure Maco.la’s work falls within SEC securities regulations. The SEC is currently conducting a cryptocurrency probe, examing around 100 hedge funds that are associated with cryptocurrencies.